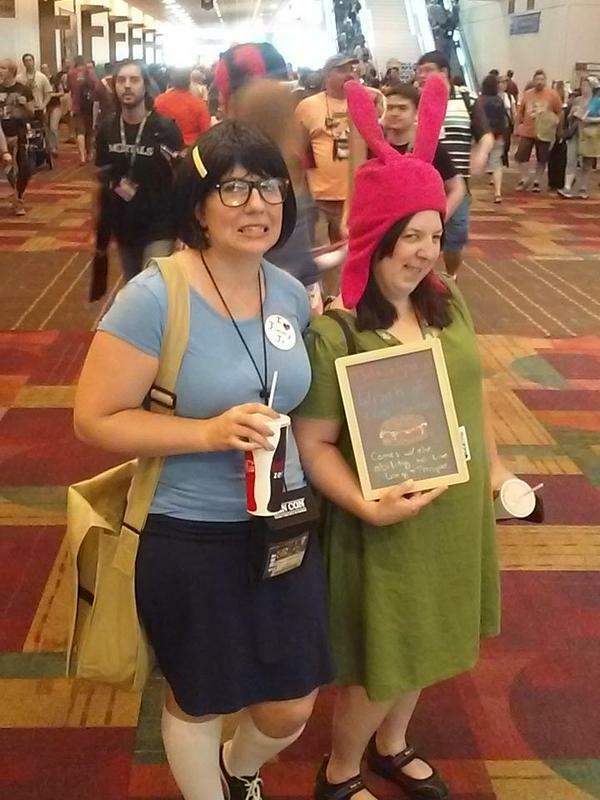 So- GenCon. It was wild, it was crazy- it was phenomenal. Today I’m going to give you some final thoughts on my whole experience over the last four days and next week we will be resuming our usual schedule of Friday content uploads. You’ll just have to survive somehow, dear readers, as I am absolutely wiped. So, I want to start off by saying to all the vendors, publishers, representatives and staff of the convention center itself- thank you. 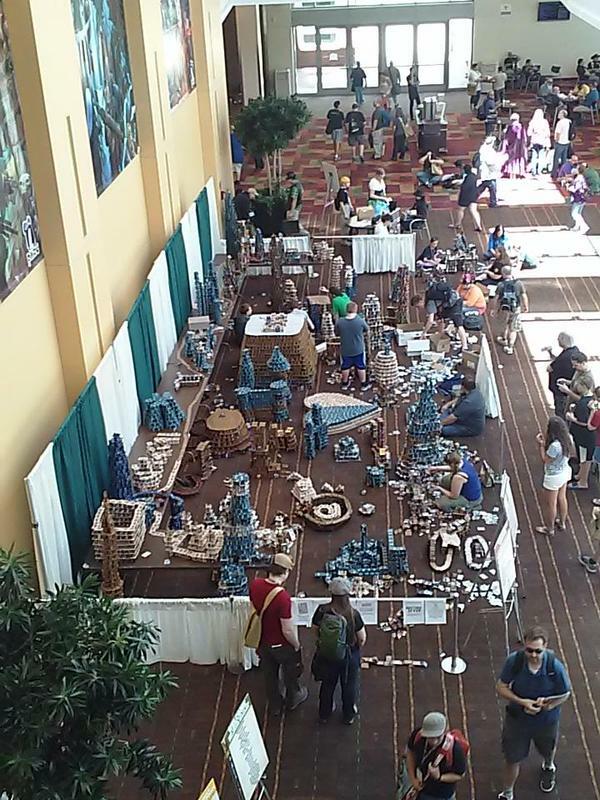 It is thanks to all of you that GenCon was as amazing as it was for the 61,423 people who attended (unique attendance- you can check out the breakdown here.) 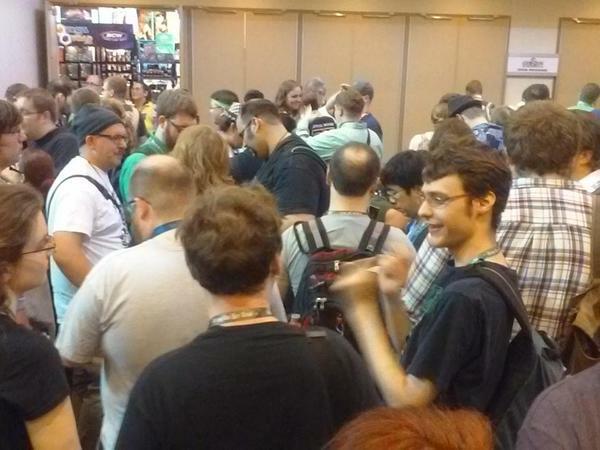 I managed to talk to many people representing some of the best publishers today in the world of board games. To all of you who took the time to speak to humble bloggers such as myself, thank you. I made some excellent contacts and if all goes well, you may soon be able to come to A Space Ahead for reports on news in the world of board gaming- so that is very exciting. Now, I would like to take some time to point out some of the games that I am THE most excited about reviewing in the coming year. Not all of these are new releases- some of them are just games that this was the first time I was able to see them up close- but all of them were exciting to me and so all of them make this list. First, Castle Assault from MomentumVolsk. I had the opportunity to sit down and have a personal tutorial in this game by the game’s designer TJ Dunbar and had an absolute blast. 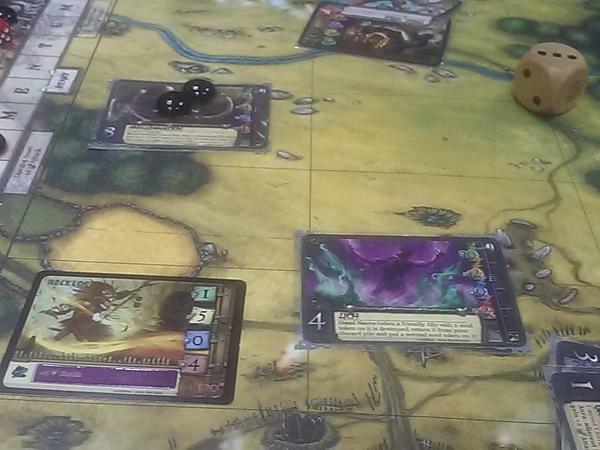 This game is a 1-2 player tower defense game using cards and dice. There are six different factions (or races) to play as which looks like it adds plenty of variation. Also, while this is early days yet- it appears as if actual thought and design went into a single player campaign, which is very exciting to see. Castle Assault started out as a Kickstarter, but they are now moving into production and appear to be making steps towards mass distribution. 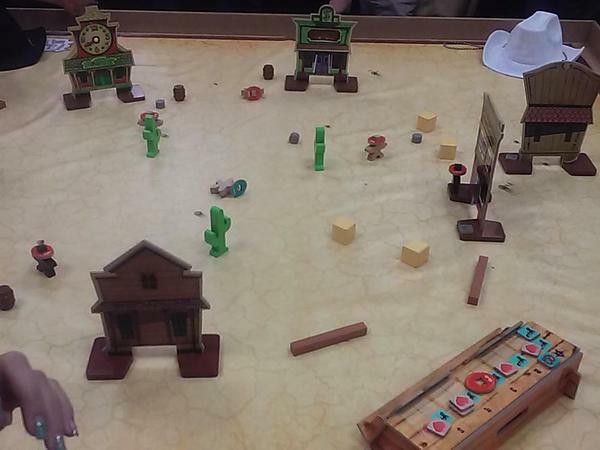 Next is Flick ‘em Up! from Pretzel Games. 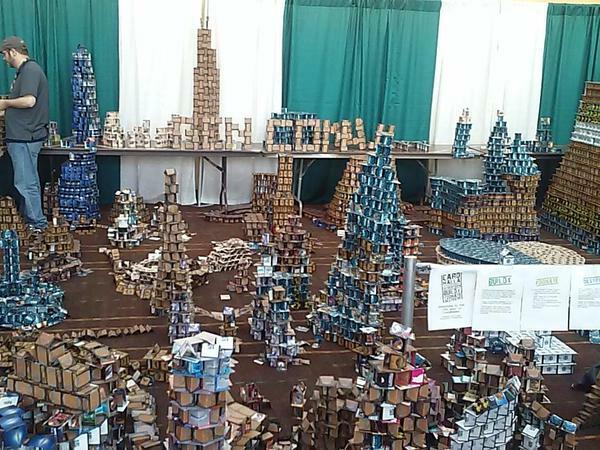 While I didn’t get a chance to actually play this one, I spent a lot of time observing it this weekend. An interesting dexterity game involving cowboys made out of big, chunky pieces of wood, this one looks like it would be a great hit at inebriated parties and children alike. I can’t wait to test this one. Another one that I couldn’t get near enough to actually play was Mysterium which is making big waves for Libellud (but is being distributed through Asmodee.) Described by other people in the industry as a strange cross between Clue and Charades- one player is a ghost and needs to communicate to the other players through the use of cards, who killed them, where, and with what in a creepy mansion. This is a big one on my list for this year. 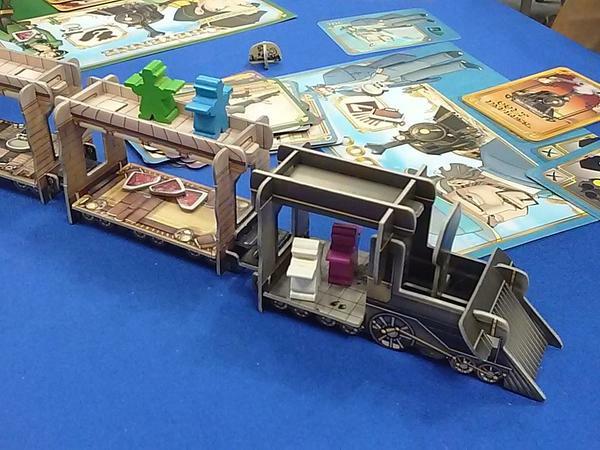 Lastly, a game that didn’t premier this year at GenCon, but this was the first time I was able to get near it, was Colt Express (from Asmodee). 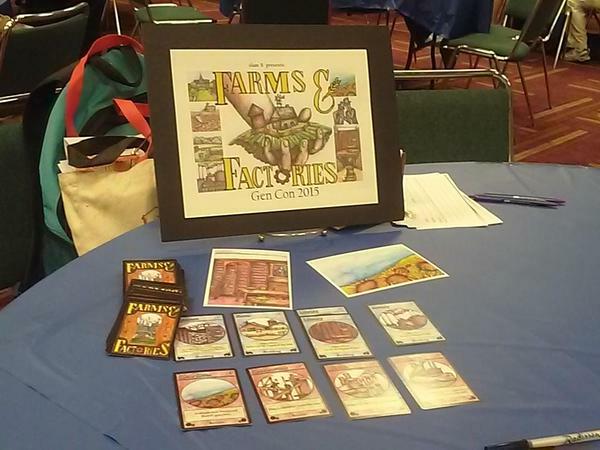 This neat programming games puts players in the roles of train robbers and laying down cards to reveal what they are doing each turn. The robber who makes off with the most money wins. This really looks like one of those games that if you’re playing, people who aren’t involved will stop what they’re doing and ask you what you’re playing. 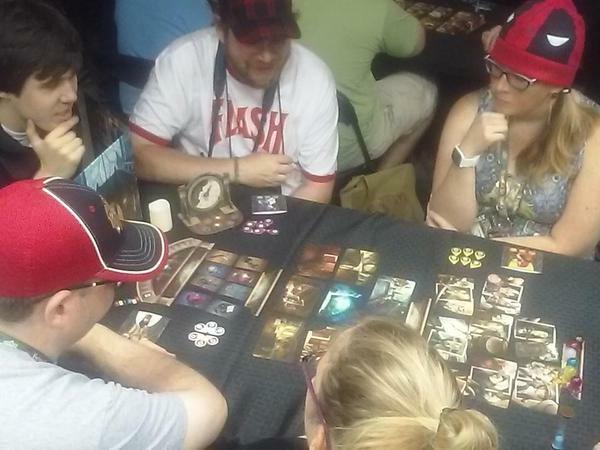 So that was GenCon- it was an absolute blast and I had a fantastic time. I think I’ll be fully recovered by this time next year. Thank you to all of you who followed our coverage on Twitter. And to all of you we met at the convention, see you next year!